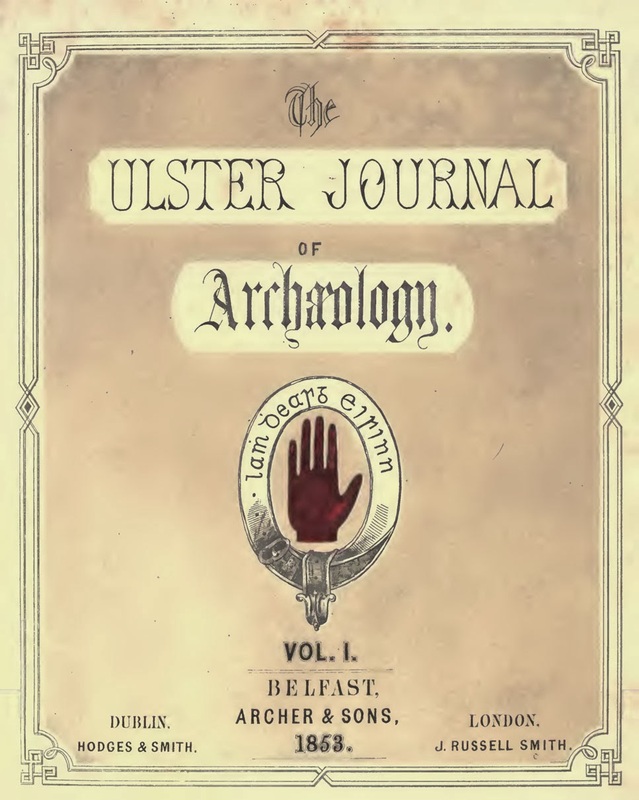 THE Editors of the Ulster Journal of Archaeology find that the subject of the Huguenot Refugees has excited considerable interest. They have received offers of literary assistance from many quarters, and have already had placed in their hands a number of curious and interesting documents belonging to private individuals, affording matter well worthy of publication. Others are promised, relating not only to the history of the French colonies established in Ireland, but to the previous history of the refugees before quitting their own country. 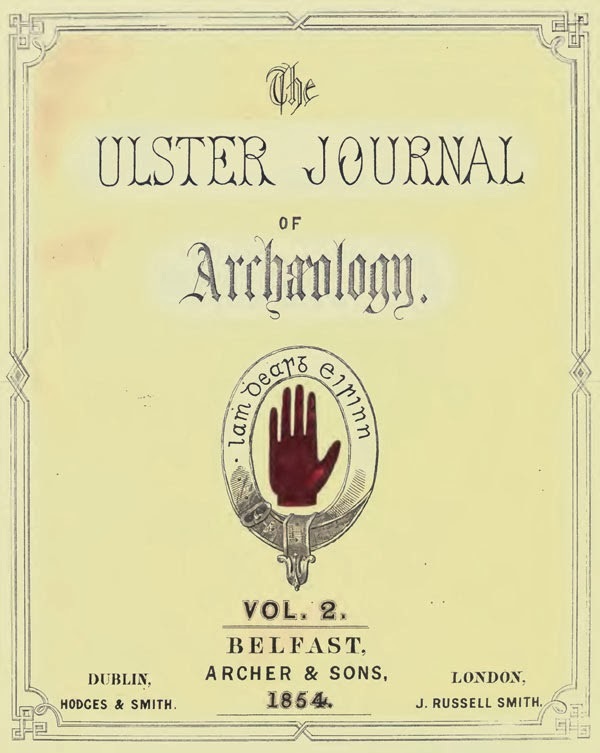 Several private Journals kept by distinguished individuals, have also been placed at the disposal of the Editors; and they have opened a correspondence with gentlemen in various parts of Ireland, who are themselves descendants of French settlers. They therefore hope to be able to collect a good deal of curious information with regard to this portion of Irish Ethnology. But they already find that the traces of many of the original families can now with difficulty be discovered. A great number of names have totally disappeared, and others have become singularly metamorphosed; while, even in the districts occupied by French families a couple of centuries ago, the traditions are fast dying away. In several cases it has been found that information respecting a family can only be obtained in England, Holland, or Geneva; and at this moment several gentlemen are at work making inquires in those countries. The Editors have, therefore, decided on postponing the continuation of the articles on the Huguenot settlers in Ireland, until next Number, in order to accumulate as many particulars as possible relating to each colony. Gentlemen residing in Dublin, Cork, Youghal, Innishannon, Kilkenny, Waterford, Portarlington, Dundalk and Lisburn, may materially assist the undertaking, by communicating any information they possess regarding the French families settled at these different places. The Huguenot Colony at Lisburn. In 1659, at the Synod of Londure, among those representing the Province of Lower Languedoc w a Isaac Dubourdieu, pastor of the church of Montpeilier, and it was resolved that, "In pursuance of an order of the same Synod, Messieurs Guilton and Dubourdieu are sent to Saumur to pacify some differences between the members of that church and Messieurs Amyrant and D'Huission. -- The nobles of the Dubourdieu family intermarried with those of De Saumarez and De Lavalade; and it was while holding this high position that it experienced the first shock of the fearful tempest which burst with such violence in the year 1685. At that time a judgment given by the parliament of Thoulouse against Isaac Dubourdieu, the pastor of Montpellier, and his son, obliged him to fly from France and take refuge in London. There he became a minister, and preached with so much zeal and effect that an authora writes of him:-- "Among them M. Dubourdieu, the father, holds a primary rank. You know that he was one of the best heads of our French Presbytery; what he was he was in Montpellier, that he is in London; wise, laborious, and entirely devoted to the refugee church, which he instructs by his frequent preaching, and still continues his exhortations though upward of ninety-five years of age." His declining years were cheered by the presence of his two sons, the elder of whom had lingered at Montpellier some months after his father's departure; and the danger to which he was exposed in so doing is thus mentioned in a letter from the Cardinal Archbishop Bonzi to the Duke de Noailles.b -- "From Montpellier, the 23d of January, 1683. * * * In the stay which I have made here, I have pursued the projects known to yon to obtain conversions; I have discovered that Bordieu (Dubourdieu) the son, a minister here, has some connections and attachments here which will facilitate his conversion, if he can be made to fear either a distant banishment or an order to depart out of the kingdom. If you think proper to send me a 'lettre de cachet' for that purpose, I am in hopes that upon showing it to him he will be disposed to listen to proposals, and that eventually, by an offer of an appointment of Counsellor to the presidial court (of Montpellier) with which the King will gratify him, having secret agents, it will not be impossible to gain him. He has merit, and will be a good acquisition." Notwithstanding these attempts he succeeded in escaping to England, where he became rector of Sawtrey Maines, in Huntingdon, where he died in 1728, at the age of seventy-two. His brother, John, still remained in France, and he, together with the widow of Lord Bourdieu, and her infant son, were the only members of the elder branch who escaped after the Revocation of the Edict of Nantes. Their subsequent history has already been been given; but the following particulars (since obtained) relating to that son, may be given to complete what is known respecting the family. He was the Rev. Jean Armand Dubourdieu, and his piety and ability were so much esteemed among his countrymen in London, that on all occasions of vacancies occurring in their churches, he was requested to select ministers for them. He was also so distinguished as an orator, that he was called on to preach before the Judges at the Summer Assizes of Chelmsford in 1714. Amongst his countrymen his benevolence was so well known that a refugee had only to come to him to find relief; in him his persecuted brethren had a warm advocate; and his faithfulness in the ministry was such that he did not hesitate to raise his voice against the corruption of the time. He did not fail to allude (though in a Christian-like manner) to the apostacy of one of the Saurin family. His gratitude for the kind reception given him by the English Protestants was sincere and lasting; and, though belonging to the French church, his appreciation of the English is manifest from the sentiment expressed in the following passage:c -- "That this church, which hath hitherto been the bulwark and glory of the Reformation, and with which all the other churches abroad must stand or fall, may survive future ages, outlast this visible world, and never end but with commencing eternity!" This family possessed large estates in Languedoc, the head of it having the title of Count de Lavalade. During the persecution of the Huguenots in France, they, like hundreds of their co-religionists, were tortured in the most cruel manner. Laval mentions the case of one lady of this family who, "having patiently suffered many exquisite pains, had at last her clothes turned up and was laid bare on a chafing-dish of coals! "d -- So much did the various members of the Lavalade family become dispersed that we can now trace the history of only three, viz. ; the widow of James Seigneur du Bourdieu of whom mention has been already made, and the Rev. Charles, and Mdl'e. de Lavalade: the two latter escaped into Holland, where they resided for many years under the protection of the Prince of Orange. Here Mdlle. de Lavalade married Alexander Crommelin, brother of Louis, the founder of the linen colony at Lisburn,e who, when inviting over a number of his countrymen to settle in Ireland, selected M. de Lavalade as their pastor, and brought him with himself for that purpose. On his arrival in Lisburn, M. de Lavalade was installed in his new office, and held it for a period of upwards of forty years. He resided with his only daughter, Anne, who married Mr. George Russell in 1737. Louis Roché was another of the French refugees who settled in Lisburn at the same time as Louis Crommelin, (being induced through his connection with him,) and was an extensive merchant there. His family consisted of two daughters, Mary and Alice: the former married Val. Jones, jun., Esq., and their descendants are now among the first inhabitants of Belfast.f The latter married Edward Masslin, Esq. These unions occurring in the same year appear to have been hastened by the declining health of their father, as he died immediately after, in the year 1726. This family possessed large estates in Guienne, in France, at Agenois. The title held by the head of the family was Seigneur de Melromez, as stated in a MS. document entitled "Agreement to be made, 9th Nov., 1570, between Noble Gerard de Geneste, Signeur de Melromez, of the town of Sarlat, so much in his name as being husband to Marguerite Paraiziare, living in the seigniorial house of Melromez in Agenois;" as also in another entitled, "Declaration of lands and lordships of Melromez given to the King, 18th June, 1645, for the sake of his possessions in Guienne, to the Treasury of France, by Jacob de Geneste, Lord of Melromez, and for the possession of the three-fourths and the other one-fourth belonging to Gabriel de Geneste's father.g Of the several members of this family, Louis alone adhered to the Reformed faith, thereby forfeiting his large estates at Beargues, about five or six leagues from Cajare, from which he took the name Louis Geneste Pelras de Cajare. After the Revocation of the Edict of Nantes he fled to Holland, and entered into the service of William, Prince of Orange, in whose army he held a commission, and whom he accompanied to England and thence to Ireland, where he served in the regiment of Lord Lifford at the battle of the Boyne and the other engagements of that time. After the pacification of Ireland he settled at Lisburn, where he resided for some years. In 1724 he went to the Isle of Man, and remained there for seven years; but again returned to Lisburn with his family, consisting of two sons and a daughter; namely, Louis, Daniel, and Marguerite, the grand-daughter of whom was married to Jean Baptiste Shannon, Esq., of Belfast, a lineal descendant of the celebrated Colbert. Louis Geneste was too far advanced in years to undertake a journey to his native land, but his feeling of affection for it was still strong, and he wrote to his younger brother (who had saved his life and property by recanting) to inform him of his son's intention of visiting France. This led to an affectionate correspondence between them, part of which is still extant. The letters from France are signed "Pelras." -- His eldest son settled in the Isle of Man, and although he made many efforts to proceed to France, for the purpose of inquiring respecting his property, he was unable to accomplish it. However, after the Decree of the National Assembly professing to restore their forfeited estates to Protestants, his son went to France to prefer his claim; but found many difficulties in the way. In June, 1792, he thus wrote to his family: -- "All matters relative to the fugitive Protestants are enveloped in darkness, and the clerks and persons attending at the different offices seem disinclined to draw aside the veil. Indeed it appears to me, as well as to my friends here, on making the needful inquiries at the offices, that it is their wish to suppress such information as would tend to throw light on the subject." Hoping, however, that he might be the means of "opening a door for the benefit of the heirs of Protestant refugees, which, by the chicanery of those vipers in office, has been closely barred up, and that in direct contradiction to the liberal terms of the Decree," he wrote to the President of the National Assembly, mentioning the difficulties he had met with at the different offices, and his inability to obtain the Table of Forfeited Estates, agreeably to the intention of the Decree, 19th Article. This letter was transmitted to the Minister of Justice, and he subsequently wrote to that official himself, and then waited on him, when he was received with politeness. The Minister apologised for the neglect of his predecessors in office in not obeying the Decree, and mentioned that he had given orders for printing the list of Forfeited Estates; but that this being a voluminous document it would require a fortnight to complete it: and, in the meantime, handed him a written order for access to the manuscript. By means of this he was able to ascertain the situation of his father's estates; and his anxiety to visit them was so great that he left Paris for Bordeaux before the expiration of the fortnight, with the assurance that the list would be forwarded to him. He had hardly reached Cajare when he was arrested on suspicion of being a spy, and it was not until after a minute inspection of his papers and letters of introduction that he was set at liberty. M. Pelras and his son, an Abbé, chanced to be present during the examination, and to his great surprise the latter accosted him thus:-- "We are your nearest relations. The late M. Pelras of Cajare was brother to my father, and, consequently the same to your grandfather, of whom I heard that he had left this country, as well as another brother." He dined with the Abbé and met several of his nearest connections. "After dinner," he continues, "the Abbé proposed going with me on the following day to Beargues, the ancient estate of the family, a moiety of which was in possession of his father, and mentioned that the remaining part of the paternal inheritance had been held by the late M. Pelras of Cajare, and, being sold by him, had passed through several different hands. The Abbé promised to procure at Beargues (as they could not be obtained elsewhere) every document I might require relating to the estate and family of my ancestors. I accordingly arranged to accompany him; but in the afternoon he excused himself, saying his attendance in his parish was indispensably necessary, and that he was sorry it so happened. I told him my time would not admit of any further delay, and that I must return the following morning to Figeac on my way back to Bordeaux." At last, finding all endeavours to procure further intelligence fruitless, he returned to England, and died there leaving many descendants, among whom we may particularize the names of Stowel and Geneste, well known to the Christian world. The estates of this family were situated in Guienne, and the title borne by the head of the family was that of Seigneur de Blaquiére. One individual settled in London, and became an eminent merchant; and his sons held a high position there. Another branch of the family was induced to settle in Lisburn, in consequence of the marriage of a Mdlle. de Blaquiére to John Crommelin, nephew to Louis. It appears from some fragments of the Comte du Perrin's correspondence that many enticements were held out by the King to induce him to change his religion; but all without effect. An unrelenting persecution then commenced, to which he makes frequent allusion in his letters: one of his friends was sentenced to the galleys for three years. He at length contrived to escape from France, and settled in Lisburn for several years; subsequently removing to Waterford. His descendants have become honoured members of the Irish Bar. One of the family was long known as an excellent French teacher in Lisburn, and the author of a good grammar of that language. [a] Apologie des Réfugiés, pp. 98, 100. [b] Family Papers of De Noailles in the library of the Louvre, quoted in the "Bulletin de la Société de I'Histoire du Protestantisme Français. -- Tom. I., p. 114. [d] Laval's History of the French Reformation, Appendix, p.7. [e] See ante, vol. I., p.214. [g] "Registry of the confiscated estates of the Religious Fugitives," in the Rue de Clerü, near the Gros Cheret. 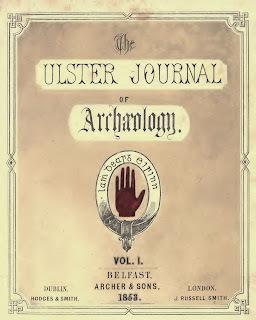 The above article is reproduced from the Ulster Journal of Archaeology, vol. 2, 1854. Almost the only record of the greater number of the names of the settlers is to be found on the tomb-stones in the church-yard, and in the Lisburn Parish Register, to which access was kindly permitted by the Dean of Ross. Many appear not to have long survived their change of country; others have left descendants in the neighbourhood till the present day; while in some families the names have become extinct by the marriage of the female branches, and the death or emigration of the males. The following particulars, after much inquiry, are all that could be obtained of the Family History of some members of the Colony. Captain Paul Mangin was born at Berlin, whither his family had removed, on account of their religion, from Metz in Louvain, after a sojourn in Cologne. He was twice married; to Madeline Crommelin, (sister of Louis,) and again to Anne Henriette d'Onie de la Laude, a French Protestant of a noble house in Saintogne, in the west of France, from which place her father, with many others, emigrated in the reign of Louis XIV. I did myself the favour to write to you the 21st instant, in answer to yours of the 28th May. I hope that my letter will come safe to hand, and wish to have an opportunity to make amends for the trouble and cost of postage I put you at. This will acquaint you that I have a nephew named Alexander Crommelin, who served his apprenticeship to a surgeon in Lisburn, in the north of Ireland, and since has been at Edinburgh two years, attending the colleges and hospitals; he arrived from Scotland about four days ago, and was there all the time of the troubles, and attended the wounded. He is a sober youth, and has taken much pains during his time to perfect himself, as to surgery and physic. As he designs to enter as a surgeon in the army in time, he would fain begin by being surgeon's mate, which he would immediately purchase. I am thinking that he could not be better off than with you, if you wanted such; and would be glad he was to serve under you: if he can't have that happiness, I shall be much obliged to you to enquire for one in some other regiment, and to acquaint me how much is desired for it; the price of it is ready to be paid at sight. He was offered one when in Edinburgh, in Brigadr. Bleith's Regt., when the college was sitting, but at that time would not accept of it, till the college was up. It would give me great pleasure that I had the luck to succeed in my request to you for myself and nephew together, the answer of which I wait with impatience. Mrs. Mangin was to see Mrs. Pilot this day, who continues better, and has her love to you. My spouse and family have their compliments to you; Capt. Debrisay and his lady join in the same; they passed the afternoon with me yesterday. My compts. to Mrs. Jaspar, PAUL MANGIN. In the Honble. Colnl. Battereau's Regt. 1. The Rev. John De Bourdieu, who became chaplain to Duke Schomberg, and one of the ministers of the French church, in the Savoy, London. He accompanied Duke Schomberg to Ireland, and was by his side at the Battle of the Boyne; receiving him in his arms when he fell from his horse, mortally wounded. He afterwards proceeded with the son of Duke Schomberg to Turin, with whom he remained during the Italian campaign, and accompanied him into France, where he was present at the siege of Aubrun in Dauphinè. There he received the recantation of various French Protestants who had been forced to abjure their religion, and exhorted them, in several eloquent discourses, to continue firm in the faith. This event was brought about by a Proclamation of Duke Schomberg, announcing that his Majesty had no other intention in invading France, than to restore to the Protestants their ancient privileges, and grant protection to their clergy; also to procure the revival of the Edict of Nantes. On his return to Turin after the Italian campaign, he witnessed the religious honours paid to the "Martyrs of the Thebean Legion;" and, having convinced himself that the tradition concerning these saints was entirely fabulous, he wrote a work of great research and powerful argument to expose the imposture. [e] Whilst residing in that country his attention was forcibly drawn to the sufferings of the "Vaudois," which made such an impression on his mind that on his return to London, he induced Dr. Lloyd, the Bishop of St. Asaphs, to espouse their cause. 2. The widow of the Lord Bourdieu, daughter of the Count de la Valade. This lady, disguised as a peasant, with her infant son concealed in a shawl on her back, and accompanied by a faithful domestic, effected her escape through the frontier guards into German-Switzerland, and thence to London, where she was received by her relative. The child, called Jean Armand, was educated as a clergyman, and became minister of the Savoy, and Chaplain to the Duke of Richmond and Lenox. He married the Comtesse d' Espuage, and had one son, Saumarez. He attained great eminence in his profession, and was author of a volume of sermons, in the French language, much valued at the time. [f] He died in the midst of a useful career, at the early age of 40. His son Saumarez was educated for a minister in Trinity College, Dublin, and, it is supposed, was brought to Lisburn through the influence of his relative the Rev. Charles de la Valade, the first French chaplain there. He was so much esteemed, that the Earl of Moira, (afterwards the celebrated Marquis of Hastings,) was entrusted to his care, and educated in his family. He married Miss Thompson, and had three sons, John, Shem, and Saumarez; and two daughters, Charlotte and Anna, who died unmarried. He continued for 45 years minister of the French church at Lisburn; and, as the congregation had decreased, (owing to deaths and intermarriages, and from many having joined the Established church,) he was made incumbent of Lambeg, having previously been acknowledged as a minister of the Church of England. He held this situation till his death, which took place at the advanced age of 96. He was beloved and respected by all classes, and his memory is yet revered by the descendants of the French, as well as by the old inhabitants of Lisburn. His eldest son John, also became a minister, and was rector of Annahilt, in the county of Down. He devoted much attention to literary pursuits, and was author of "A Statistical Survey of the County Antrim," a work of considerable learning and research, published in 1812. He married Miss Sampson, and had five sons and four daughters: Saumarez, Arthur, John Armand, Francis, and George: his daughters were Selina, Catherine, Margaret, and Maria. He died at the age of 86. His eldest son, Saumarez, entered the army, in the Royal Artillery, at an early age, and was in active service throughout the whole war, till he was killed at St. Sebastian, having attained the rank of captain. He was in command of the troops at the capture of Martinique, where a little incident of rather an interesting nature took place: the commanding officer of the French, in surrendering his sword to him, addressed him in these words: "My misfortune is the lighter, as I am conquered by a Dubourdieu, and a beloved relative -- my name is Dubourdieu." This individual is now Lord High Admiral of France, and is a descendant of the younger branch of the family before alluded to. His second son, Arthur, also entered the army, and, having endured all the dangers and hardships inseparable from a life of constant active service, in which he ultimately attained the rank of colonel, died in consequence of wounds received at the storming of Badajoz. His third son, John Armaud, obtained a situation in the Customs. The fourth son, Francis, entered the Royal Hanoverian Engineers, obtained the rank of captain, and was honoured by the warm friendship of the Duke of Cambridge. He still survives. The youngest son, George, joined the Patriots in South America, under Bolivar, and perished there. Shem, second son of the Rev. S. Dubourdieu, settled in Longford, and married a Miss Brown; he had one son, Saumarez, who settled in Cookstown, and married a Miss Carmichael, who had eight children. After his death his family removed to Dublin. Saumarez, the third son, died unmarried. Peter Goyer was a native of Picardy, and an extensive farmer, as well as manufacturer of cambric and silk. After the Revocation of the Edict of Nantes, having seen his family scattered, and his brother killed by the ruthless soldiers of Louis XIV, who added to their cruelty the mockery of tearing a leaf from his Bible, and forcing it into his mouth before he died, (the record of which transaction is still preserved in the family,) he escaped from France, and came to Lisburn, where he introduced his branches of manufacture; but, still cherishing the hope of regaining his lost property, he returned after some years, secretly to France. Here, finding his efforts fruitless, and being again persecuted and pursued, he found means to escape by concealing himself in a wine-cask, and was so shipped from Bourdeaux. Returning to Lisburn, he resumed his former occupations, and employed a number of hands in the manufacture of silk and cambric. The silk manufacture was carried on in Lisburn until the end of the last century, when the Rebellion dispersed the work-people: and it has not been re-established. The cambric manufacture, however, became finally fixed in Lurgan and its vicinity, and has arrived now at such perfection, that the cambric handkerchiefs made there compete successfully with those of France. He also acted as clerk in the French chapel, which post he held till his death, at an advanced age, leaving an unblemished reputation to his descendants, some of whom still reside at Lisburn. Mark Henri Dupré escaped, after the Revocation, to the south of Ireland, and made his way to Dublin in 1690. At this time William III. held out special protection to the Refugees, of which he took advantage, and settled in Lisburn, where he carried on the trade of reed-making, being much encouraged and supported by Louis Crommelin. His descendants still remain in Belfast. Réné Bulmer and his wife fled from France, a short time before the Revocation of the Edict of Nantes, and with some others similarly situated, established themselves in Lambeg. Bulmer resided in a house now called the Priory. It is said he helped to repair King William's carriage, when it broke down at Lambeg. It is of him the anecdote is related in a former number of this Journal, (p. 135.) He died, leaving a family who settled at Hill-Hall, and Lisburn, and was buried at Lambeg. The name is now changed to Boomer, and the Christian name Réné, or Rainey, is still preserved in the family. ERRATUM, p. 215, 1. 21. -- For "Sergent de Chery, et Maitre des Regents, read, "Signeur de Chery, et Maitre dex Requétes. [e] The work is written in English and is entitled -- "An Historical Dissertation upon the Thebean Legion, plainly proving it to be fabulous. -- By John Dubourdieu, M.A. Chaplain to his Grace the Duke of Schomberg and Leinster, and one of the Ministers of the French Church in the Savoy. -- London, printed for R. Bentley, in Russel Street, in Covent-Garden, 1696." -- It is dedicated to the Right Honourable My Lord Mouthermer, eldest son to the Right Honourable the Earl of Mountague, Master of the Wardrobe, and one of his Majesties most Honourable Privy Council. [f] The title of this work, was "L'indigne Choix des Sichemites, on L'Apologue des Arbres et de l'Epine appliqué à la conjoncture présente en deux sermons sur Juges IX. 14, 15, où l'on fait voir que un Regne Papiste est incompatible avec la constitution de la Grande Bretagne. -- Par Jean Armand Dubourdieu, Ministre de la Savoye, et Chaplain du Duc de Richmond et de Lenox. -- "All that is dear to you must irrecoverably be lost if ever the designs of a Popish pretender bred up in principles of the most arbitrary government should take place." La Reine Anne dans la Harangue qu'elle fit en Parlement en 1708. -- A Londres, chez Thos. Eddin, Imprimeur et Libraire, aux Armes du Prince, vis-à-vis Exeter Exchange dans le Strand. 1733. 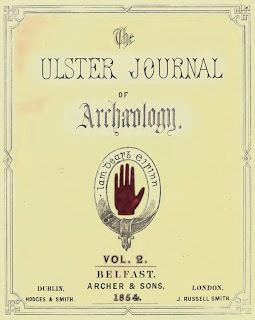 The above article is reproduced from the Ulster Journal of Archaeology, vol. 1, 1853. Having now traced the history of the Lisburn colony, and the causes which led to its foundation, and given the biography of its founders, it may not be uninteresting to glance at the state of the town itself, at the time when L. Crommelin chose it for the seat of his operations, as well as at the condition of the Linen Manufacture at that period. Lisnegarvey [Lisburn] had, at this time, recovered from the siege of the Irish rebels, under Sir Phelim O'Neill,* and was almost in the same condition in which an English traveller described it about 45 years previously: "Linsley Garven, about 7 miles from Belfast, is well seated, but neither the town or the country thereabouts well planted, [inhabited,] being almost all woods and moorish, until you come to Dromore; the town belongs to Lord Conway, who hath a good handsome house there." There were not more than 100 tenements, besides the Castle, then remaining perfect:-- the town returned two members to the Irish Parliament; and was the residence of the Bishop of the United Diocese of Down and Connor, its church being the Cathedral of the Diocese. A wooden bridge here crossed the river Lagan, and it was at the foot of this bridge, at the western side of Bridge-street, that Louis Crommelin built the first linen-factory; the old water course of which remained until the beginning of the present century. He also established a bleach-green at a place in the vicinity, now called Hilden; and, having obtained a Patenta from King William, he commenced operations for the improvement of the Linen trade. This manufacture had made little progress in Ireland from the time of Lord Strafford, (in the reign of Charles I,) who was the first to adopt any measures for its encouragement, and who may therefore be considered its founder. It is known that Linen was manufactured In Ireland from the earliest ages, and it is said by some to have been introduced, (with the spindle and loom,) by the Phoenicians; but, of course, in a comparatively imperfect state. Yet it was extensively used, and formed even, a considerable article of commerce, as is proved from an act of Henry VIII, and another restricting the higher orders from wearing an extravagant quantity of linen in their shirts. It was exported as early as the reign of Henry III: as we find mention made in Maddox's History of the Exchequer, of two thieves, who stole some Irish linen, amongst other goods, at Winchester, and fought about it. The Irish themselves used it largely in their garments, the long "Cota" being made of it: as Camden mentions that O'Neill and his followers were so clad when they visited Queen Elizabeth. Nevertheless, Louis Crommelin was justified in the expressions he used in his publication,b "that the people were entirely ignorant of the misteries relating to its manufacture." This he attributed "to the prejudices that prevail in the minds of the people, that the spinner's, the weaver's, and the bleacher's trades are such poor abject trades, all the world over, and particularly in Ireland, that it is impossible for men of a free, generous spirit, (such as the people of this kingdom must be allowed to be,) to conform themselves thereunto; they having no prospect of sufficient benefit or reward." The way in which the flax was prepared was very pernicious; "being managed by women altogether ignorant as to their choice of their seed or soil, for which reason their flax was and is too short, and unfit for making good yarn; they do not know when or how to pull their flax, whereby their seed degenerates, and their flax wants strength and substance. They have no judgement when or how to water or grass their flax, so as to give it a natural colour; and what is yet worse than all is, they constantly dry their flax by the fire, which makes it impossible to bleach cloth made of their yarns; for let all the skill and judgement of the world be used to bleach cloth made of different sorts of flax, you shall never bring it to a good colour: for, till such a time as it is woven, and so bleached, the best artist in nature cannot discover the mischief. They also use, in cleaning their flax, things which they call "breaks," which I can in no way approve of. They spin their long and short flax athwart, which is extremely preposterous, as the flax cannot be spun fine; so the linen is cottony. The wheels used in spinning are turned by the foot, and have two cords, one going round the wheel and the whirl of the spindle, the other going round the wheel and whirl of the spool, which overtwists the thread. Their manner of reeling yarn is one of the greatest grievances, as many honest, industrious men are undone by the deceitful methods now used by the crafty and unfair people in this particular; as, for instance, there is no standard for the measure of reels, and every body uses such reels as they think fit; for which reason a stranger to the markets is imposed upon to his ruin. The cuts and hanks are reeled by several threads, through laziness or wickedness to the utter ruin of the poor dealers, who think they buy yarn, and that they have good and marketable goods for their money; but, on the contrary, find that the whole hank ravels altogether, and becomes entirely unserviceable, or, at the best so troublesome to wind, that it is as eligible to lose it, as to spend so much time and pains as to wind it. They ought to mark each cut, or six score threads as they reel them, and not afterwards, as they now do; which they might do without difficulty. They do likewise intermix, in one and the same hank, yarn of several degrees of fineness, which is a cheat intolerable to the buyer. The looms generally employed in this kingdom for the making of all sorts of linen cloth, (excepting diaper and damask,) are looms properly disposed and invented for the making of woollen cloth, (save only that they changed the gear, and wrought, promiscuously, linen and woollen therein,) therefore it is impossible to use one and the same loom to both material, with good success." With respect to the mode of bleaching, Mr. Crommelin objected that, "The manner of mixing their ashes and yarn together in the keeve, at the same time that they buck their yarn, and purely through ignorance, or laziness, makes their yarn fret and cotton for ever. -- After having detailed his improvement, he says, "They who are disposed to erect one of these bleacheries, may with much greater satisfaction come and view one small bleachery at Lisburn, which may serve as a model, than bestow the time in reading an intricate description of what a bleachery consists." [a] The following is the substance of the Patent. -- "In consequence of a proposal by Louis Crommelin to establish a Linen Manufacture in Ireland, and the design and method in said memorial being approved of by the Commissioners of Treasury and trade: the following grant was made. That £800 per annum be settled for ten years as interest on £10,000 advanced by said Louis Crommelin, for the making a bleaching yard, and holding a pressing house, and for weaving, cultivating, and pressing hemp and flax, and making provision of both to be sold ready prepared to the spinners at reasonable rate, and upon credit; providing all tools and utensils, looms, and spinning wheels, to be furnished at the several costs of persons employed by advances, to be paid by them in small payments as they are able; advancing sums of money necessary for the subsistence of such workmen and their families as shall come from abroad, and of such persons of that our kingdom, as shall apply themselves in families, to work in the manufactories: such sums to be advanced without interest, and to be repaid by degrees. That £200 per annum to be allowed to said Crommelin, during pleasure, for his pains and care in carrying on said work, and that £120 per annum be allowed for three assistants, together with a premium of £60 per annum, for the subsistence of a French Minister, and that letters patent be granted accordingly. -- Dated 14th February, 1699. [b] An Essay towards the Improving of the Hempen andFlaxen Manufactures in the Kingdom of Ireland. By Louis Crommelin, Overseer of the Royal Linnen Manufacture of that kingdom. Dublin, 1705. [c] Extract from the "Patriot" Newspaper, January, 1818. -- "History and Chronology more frequently record those events that tend to the glory, rather than to the prosperity, of nations. Thus in the various tables of remarkable occurrences the establishment of our great staple, the Linen Manufacture, is omitted. It was on the 13th of October, 1711, that his Grace the Duke of Ormond, having appointed trustees for the Linen Manufacture of Ireland, they were, by his grace's direction summoned to the Castle of Dublin, where the deed of their appointment was read to them. The individual who, in establishing the Linen Manufacture in Ireland, contributed so much to its prosperity, deserves to be memorized amongst our most illustrious countrymen, whether statesmen, legislators, or warriors. The name of this person, now so little known, was Louis Crommelin, who in a space of 14 years, with a colony of about 70 persons, brought from Holland to Lisburn, overcame many disabilities and obstacles, and settled the Linen Manufacture in the Northern Counties, by a vote of the Irish Parliament, on the 30th of October, 1707." [d] The humble petition of Louis Crommelin, Overseer of the Linen Manufacture. That your petitioner was sent into this Kingdom by the late King William, therein to establish a Linen Manufacture, with his Royal word and promise, that he should receive a recompense, proportionable to the services he should render, which promise was a powerful motive for your petitioner to overcome all the difficulties and obstacles he has since met with, in the prosecution of his designs. That within these 14 years your petitioner hath (together with the colony of about 70 persons he brought into this country from France and Holland, now increased to the number of 120) applied himself with all possible care and diligence to the forming of a settlement, having spared neither his person, nor his and his friends' substance, to make it succeed; which, (by the Grace of God) he has accomplished, to the great satisfaction of this nation: insomuch, that the Parliament, being sensible thereof, did, by their vote of the 20th of November, 1703, recommend him to your Grace, as a person very fit and useful for establishing manufactures in this kingdom: and by a second vote of the 20th of October, 1707, that Louis Crommelin has been eminently useful to this Kingdom in promoting the Linen Manufacture thereof; that though the said manufacture be settled in the province of the North only, nay, but in three or four counties of the same, yet the kingdom reaps a great benefit by the quantities of linen and yarn which are every year exported out of it, as appears by the annexed abstract: and considering it was not possible for your petitioner to impart unto the whole nation the knowledge God has given him in the said manufactures, he did print and publish a compleat treatise of the said manufactures from their first origin to their perfection, dedicated to your Grace, which has proved of great use to the public and it is since the publication of the said treatise that the said manufactures have increased both in quantity and perfection. May it therefore please your Grace, in tender consideration of the premises, to grant unto your Petitioner and his said Colony, a renewal of the said Patent, for ten years to come, or such other term as your Grace shall think reasonable, and unto your Petitioner in particular, a pension of £500 per annum, as above mentioned, or as to your Grace shall seem meet, and your Petitioner shall ever pray. Before Lady Mount Alexander's death, her cousin, Madeline de la Cherois, married Daniel Crommelin, (her mother's nephew,) and died, leaving three sons; and at the death of Lady Mount Alexander, the estates were left divided equally between the eldest of these and her cousin, Samuel de la Cherois: but Nicholas Crommelin dying unmarried, and neither of his brothers having male heirs, left his portion to the youngest of Samuel de la Cherois' sons, who then took the name of Crommelin. Nicholas de la Cherois being the only one of three brothers who left a son, may consequently be considered as the head of the Irish branch, and to his history we therefore return. He still continued in the army, and was engaged with King William in all his continental campaigns, obtaining his Majority about 1694. After William's death he again served under the Duke of Marlborough, and distinguished himself on several occasions. Tradition records that one of his promotions was received in consequence of his having made 1500 men lay down their arms, with only a subaltern's guard; and that, besides promotion, he received a reward of 1500 crowns. His commission as Lieutenant-Colonel was drawn out, but not gazetted, when he unfortunately lost his life about the year 1706, through the carelessness of an apothecary, who sent him poison in place of medicine. In a subsequent article we purpose to collect all the particulars now known relating to the Linen Factory at Lisburn, and the other Huguenot families who settled there. Distress of the Huguenot Refugees. 16 April, 1689. "Acts of the English Parliament. -- It was ordered that the Committee to whom it is referred to consider of a way to relieve the French Protestant ministers, and such as are incapable, otherwise than by charity, who are fled out of France for their religion, have power to send for persons, papers, and records." The Committee report, 24 April, "That the French ministers and divers other Protestants of France, fled hither for refuge, being summoned, appeared and expressed a high sense of their gratitude for the generosity and charity of this House, in taking their distressed case into consideration; and to show how ready they were to manifest their fidelity to the Government of this nation, they represented how the youngest and strongest of their body were lately formed into three regiments, who were ready to lay down their lives in defence of the Protestant religion and liberties of England; that there are nearly 20,000 more of them who exercise their trades in divers parts of this kingdom, without any detriment (they humbly hope) but rather to the advantage of the people of this nation: but that there still remain above 2,000 persons, some of them old, others infants, others sick and impotent, but all unable to provide for themselves; divines, physicians, merchants, gentlemen, common people, many of them heretofore rich and flourishing in their own country, but are now reduced to the utmost misery, and must infallibly perish and starve, unless assisted by this House." -- On 24 April, 1689, the sum of £17,200 per annum was granted for their support. -- On 1st May, 1699, it was resolved "that an humble address be made to His Majesty by such members of this House as are members of Privy Council, that he will please to take the condition of the French Protestants into consideration, and afford the same relief for their subsistence." -- Reply. -- "The Chancellor of Exchequer acquaints the House that His Majesty had received the petition concerning the poor French Protestants, and to allow the same; with their Majesties' declaration of 25 April, 1689. -- William R. Whereas, it has pleased Almighty God, to deliver our Realm (England) and the subjects thereof from the persecution lately threatening them for their religion, and from the oppression and destruction which the subversion of the laws and the arbitrary exercise of power and dominion over them had very near introduced. We, finding in our subjects a true and just sense thereof, and of the miseries and oppression the French Protestants lie under, for their relief and to encourage them that shall be willing to transport themselves, their families, and estates, into this our kingdom, do hereby declare, that all French Protestants that shall seek refuge into this our kingdom, shall not only have our Royal protection for themselves, families, and estates, but we will also do our endeavour in all reasonable ways and means, so to support, aid, and assist them in their several and respective trades and ways of livelihood, as that their living in this Realm may be easy and comfortable for them. Given at our Court, Whitehall. Presented in a petition to Parliament. -- Case of the poor French Protestants. -- "The French Protestants, who, by a special Providence, have taken refuge in this country, need not to justify their retreat into a kingdom where so great zeal hath been shown for that holy religion which they profess, and for which they suffered so many things. The greatest part of them, have, after some time, found ways to maintain themselves and families by trades they were brought up to, or by bearing arms for the service of this nation. Nevertheless, there remain about 3,000 who had universally perished, had not their Majesties had compassion on them. It is for these poor Protestants that we implore the compassion of this House, beseeching you to consider that among them are 1. many persons of good quality, born to fair estates, and bred accordingly without trade or profession, which, after being ruined by the Dragoons, were forced to come over without any part of their estates: 2. a great many ministers, whose education and attendance on their ministry do render them unfit for any other work, and who are so much more worthy of compassion, for that Edict, which broke the Edict of Nantes, did command them to depart out of the kingdom of France in fifteen days, upon pain of being sent to the galleys; so that they are come naked and destitute of support into the several countries where they have taken refuge. 3. Many gentles, and others brought up either to the law or physic, and many merchants and tradesmen of all sorts, who, by great age, and infirmity, and losses, are disabled to follow any employments:-- besides children yet too young to be put to any trade. All these are now reduced to the greatest extremities, and will be forced to beg their bread about the streets, if not speedily relieved. Above thirty ministers, who are maintained in the country by charity money, will be obliged to quit their congregations, and will be immediately followed by their flocks: both being necessitated to come to London to get bread. The unparalleled charity which this generous nation hath manifested to them since their coming, makes them to hope that it will not suffer them to be reduced to that sad extremity." Report of the Commissioners of Trade (to promote trade in the kingdom,) presented to the House of Commons, England, 26 May, 1700; -- Extract. -- "His Majesty having likewise referred to our consideration some proposals made by Mr. Crommelin, a French refugee, long experienced in the linen manufacture, for the more effectual establishment and improvement or that manufacture in Ireland, we humbly offered our opinion that his Majesty would be pleased to allow £800 per annum for ten years, to pay the interest, at 8 per cent, of £10,000, advanced by said Crommelin and his friends, for the setting on foot of that manufacture. The said £800 to be received and issued out by trustees appointed by his Majesty to inspect the employing of the said £10,000: and his Majesty having been pleased to give directions accordingly, the said Crommelin is lately gone to Ireland in order to put his proposals into execution: and we have reason to believe he will be able to make a considerable advance therein." Pensions paid to French colony at Lisburn. A petition of Louis Crommelin, "Merchant and Overseer of the Linen Manufacture of the kingdom," representing the great improvement of the Linen Manufacture in the kingdom, and the present state thereof; praying his services and those of the French colony, concerned in the manufacture, may be taken into consideration was presented and read, 1707. In 1717, a petition was presented to the House of Commons by "Louis Crommelin, gent, proposing, upon a suitable encouragement, to set up and carry on the Hempen manufacture of sail-cloth, in such part of the kingdom as the House thinks proper." Commission appointing Nicholas de la Cheroy, Lieut. 1675, -- "A Mou, de Sclana, Cappne. d'une Compe. franche d.g. Inftie de fuziliers pour mon service. -- La Cheroy. -- Mon. de Sclana ayant donné ā M. de la Cheroy la charge de Lieut, de la compe franche d'infie de fuziliers que vous commandez, vacante par la retraite de Dobayne, Je vous fais cette lettre pour vous dire, que vous ayez à le faire recevoir, et à s'établir en la ditte charge et recon. en telle de tous ceux à moy qu' il appartiendra la presente restant pour notre foy. Je prie Dieu qu'il vous ayt, Mons. de Sclana en sa ste garde. Ecrit à Versailles, le douzieme Avril, 1675. -- LOUIS." Commission, dated 16 Nov. 1677. -- "Pour le Sr. de la Cheroy, -- NOUS, par la grace de Dieu Roy de France et de Navarre, à notre cher et bien-aimé le Cappne la Cheroy salut, -- La Compnie franche d'infanterie de fuziliers que commandoit le Cappne de Sclana estant à present vacante par sa démission, et désirant remplir cette charge d'une personne qui s'en puisse bien acquitter. Nous avons estimé ne pouvoir faire pour ce Seigr. une meilleur choix que de vous, pour les services que vous nous avez rendues, dans toutes les occasions qui s'en sont preséntées, où vous avez donné des preuves de votre valleur, courage en la guerre, vigilance et bonne conduite, et de votre fidélite et affection à notre service: A CES CAUSES et austres à ce nous mouvant. Nous vous avors commis, ordonné, et estably, comme tous ordonnés et establissés par ces présentes sigénes de notre main, Cappne de la dte Compie franche vaccante comme du et en y dessue; Laquelle vous commandirez, conduirez, et exploiterez souby notre autorité et souby celle de nos lieutenants * * * * qu'il vous sera par Nous ou eux commandé et ordonné pour notre service, et nous vous ferons payés ensemble les officiers et soldats de la dte. Compie des estats, appointements, et soldes, qui vous seront et à eux deuby, suivant les moustres et revues qui en seront faittes par les commissaires et controlleurs des guerres et de la patrie, tant et si longuement que la dte Compie sera sus pied pour notre service et nayr la manef acquelle vine en si bon ordre et police que nous n'en puissions revenues déplantés. Tel faire nous donnons pouvoir, commission, autorité, et mandement spécial; MANDONS à tous qu'il appartiendra que vous ayez faisant son obey; car tel est notre plaisir. -- Donné à St. Germains Lay, le seizième jour de Novembre, l'an de grace mil six cent soixante dix septs, et de notre regne le trente cinq. Par le Roy. "LOVIS, -- Le Tellier. -- Another contains the commission of Bourjonval de la Cherois, 1677. The next contains merely leave of absence for two months to Nicholas de la Cheroy, and is only interesting from the date (24 Feb. 1686,) rendering it probable that it was obtained for the purpose of then making his escape, as, excepting his passport of the same period, it is the last of the official French papers. The following is a copy of the passport alluded to, which is worth recording, as it gives not only the age, but the personal appearance of Nicholas de la Cheroy: he must have been born about 1661. It is headed, as usual, with the Fleurs-de-lis, and proceeds: "Joseph de Ponts, Baron de Montelar Lieut. Gen. des armes du Roy, Mestre du Camp, Général de la Cavallerie legére de France, Commandant en chef pour sa Majesté dans la Haute et Basse Alsace, Suntgau et Brisgau. -- Laissez seulement et librement passer et repasser le porteur du present passeport, agè d'environs trente cinq ans, de poil chattain, portant per ruque, Capitaine au Régiment des fuziliers du Roy, allant à Liege pour y faire des recrues pour le Regiment et pour la Compagnie. -- Fait à Strasbourg le vingt deuxieme Octobre, mil six cents quatre vingt six." -- The route of this recruiting-party is also among the old papers, but need not be copied here. The date of the following Commission (the first he received from King William, and which is written in the Dutch language,) seems to confirm the supposition that his "congê" had been obtained as a ruse in order to enable him to go over secretly to Holland; since, as we have seen, the permission is dated 24 February 1686, and this, 17 July 1687. Whether he afterwards returned to France is uncertain, but it seems unlikely, as his passport dates from Strasbourg. "De Raedt van State der vereenighde Nederlanden heeft uyt krachte ten ende in executie van de Resolutie, van haer Hoogh Mog. de Herrn Staten General genomen den negenthienden Junig Sesthien hondert sevenentachtigh Midtagaters op de acte van syne Hoogheyelt, den Heere Prince van Orange, Judan den 19 Jany soors, van Nicholas de la Cherois gewesen Capiteign te soer in dienst van den Konengh van Vrankrejik, geaccordeert, werdt midts dese een jaerlycks Pensiventer somme van seven hondert Carols- goldens, ingaende op heden tebetaken van Maendt tot Maendt ten comptoire van den outfanger general Mr Cornelis de jonge van Ellemat, sonder eenighe atkortinghe toy van honderstem Penningh, ofte onder wat naam hat selve soude mogen wesen, des dat hy gelionden is te praesteren den Eedt van den lande te sullen wesen gehouw ende getrown, ende te dienen in alle occasion in de welcken goedtgevonden sal worden syien en dienst te gebruiken, sulcks cels by-t Formulier van den Eeltdaer van zignde nader staet ge-expresteert -- Actum den seventhienden July sesthien hondert sevenenteeghtigh. -- Gly van Hoethye, 1687. -- TerOrdennantie van den Raedt van State. G. HAUSSINGEL. Andg." There is another Dutch Commission among the papers at Carrowdore Castle, County Down, dated a year previous to this, (12 Feb 1686,) and addressed to Lieut. Abraham de la Cheroy; but it is not necessary to copy it, as it is not known now what relation he was to the brothers, though evidently of the same family. He may have escaped a year before them, and have paved the way for their reception; and Nicholas, perhaps, did not leave France until some time after the date of the last French documents. The "Route" for the recruiting party, already alluded to, after his "congé" had expired, is dated from Versailles, August, 1686; after which follows the passport dated 22 Oct., 1686: and his first Dutch Commission bears date 17 July, 1687, nearly nine months after. Should our supposition be correct, it proves the urgent necessity for his flight, since the circumstance of remaining so long behind the multitudes of his countrymen would show the great reluctance with which he went at all. The next Commission is the first one received subsequent to William's assuming the crown of England, and, as no Christian name occurs in it, it is uncertain whether it belonged to Daniel or Bourjonval; the latter is most probable, from his having previously served in France under Nicholas, whose Commission immediately follows, at the same date. A Commission, appointing Nicholas to a Majority, closes the number preserved of this period: the one appointing him Lieutenant-Colonel not being quite, (officially,) completed, (although drawn out,) at the time of his death. WILLIAM REX. -- William and Mary, by the Grace of God, King and Queen of England, Scotland France and Ireland, Def. of the Faith, &c. To our trusty and well beloved Nicholas de la Cherois, Esqre, greeting: We reposing especial trust and confidence in your loyalty, courage, and good conduct, do, by these presents, constitute and appoint you to be Major of our Regt of foot commanded by our trusty and well-beloved the Comte de Marton, and likewise to be Capt. of a company in the same. You are therefore to take the said Regiment as Major, and the said company into your care and charge, and duely to exercise the officers, as well as the soldiers thereof, in armes, and to use your best endeavours to keep them in good order and discipline; and we do hereby command them to obey you as their Major and Captain respectively: and you to observe and follow such directions, from time to time, as you shall receive from us, your Colonel, or other your superior officers, according to the Rules and Discipline of War, in pursuance of the trust we hereby repose in you. Given at our camp at Mount St. Andrs. the 1st day of August, 1694. In the sixth year of our reign. -- Le 3, Fevrier, 1694, Jay, [commusné] à l'eglise en paroisse de, St. Martin, et le s'i du dit jay wit serment du test a la Cour de la Chancellerie à Westminster, à dix heures du matin. -- By his Majesty's command, William Blethway. -- Cherois to be Major. The remaining papers and memoranda, though interesting from their antiquity, are not of any further use for our present purpose. Many valuable relics, which were still in preservation at the beginning of this century, are now lost; among others the old Commission appointing Samuel de la Cheroy to a company in 1641, the only one under Louis 13th; -- also some valuable diamonds. [k] Her faculties, even at this extreme old age, were still so perfect that she is known to have taught a child the Lord's Prayer two or three days before her death. by Charles Nicholas De La Cherios Purdon, M.D. Among the various immigrations which have so diversified the population of Ireland, there is none that has been attended with more important results than that of the French Huguenots, which took place at the close of the 17th and beginning of the 18th century. For a long series of years they had enjoyed in France the toleration granted under the celebrated "Edict of Nantes." By virtue of this law every "lord of a fief, whose power extended to capital punishments, was allowed the free and unrestrained exercise of the Reformed Religion within his own castle; every lord without capital jurisdiction was permitted to have thirty persons present at Divine Worship in his family; and the full and plenary exercise of this religion was authorised in all places under the immediate jurisdiction of a parliament." The Huguenots might also obtain offices of honour; were allowed the privilege of being tried before magistrates of their own persuasion; and might print books without applying for license to their superiors, in those cities where their form of religion was permitted. Their churches, also, as well as garrisons, were to be supported, in part at least, from the public resources. A clause, however, was introduced, restricting Protestant places of worship to certain distinct localities; none were to be erected within several miles of the capital; and several cities were held as pledges for the due performance of these stipulations. The Huguenots continued in possession of their privileges until the reign of Louis 13th, who, having established the Roman Catholic religion in Béarn, drove the Protestants to arms, and refused to make peace with them unless they would demolish their garrisons and abandon their "cautionary towns." In 1625 he attacked Rochelle, which, after a siege of many weeks, and the loss of 13,000 of its citizens, surrendered to him. After its fall he granted to the Huguenots what was called the "Edict of Grace" by which (though the exercise of the Protestant religion was prohibited at Rochelle and some other places,) the "Edict of Nantes" was to a certain extent confirmed. But the hatred to Protestantism was as strong as ever, and soon showed itself in many annoying forms. Any man who called the Protestant places of worship "churches" was made liable to a fine of 500 livres. At Rouen a Protestant youth could not be apprenticed unless fourteen Roman Catholics were taken at the same time; and no Protestant was allowed to act as an apothecary. Numerous separate edicts now appeared attacking them on all sides. One [in May 1659, and again in March 1661,] prohibited them from singing psalms, even privately in their own houses. Another  compelled them to bury their dead clandestinely, and in the night. Another  deprived the Protestant magistrates of the privilege of presiding in their courts. Another withdrew the means of instructing their children, leaving them only the minor schools, where they were taught merely to read, write, and count. Another prohibited them from printing books in favour of their religion, without permission from the King's Council; and this, of course, could not be obtained. Another obliged parents, when children changed their religion, to give them a pension. Another  prevented Protestants from giving charity to their poor brethren. Another exempted, from the payment of their debts, all those who should turn Roman Catholic. Another prohibited the ministers from preaching beyond the place of their residence. Another authorised priests and friars to enter the houses of Protestants, and to come to their bed-side, when sick or dying, to urge them to change their religion. By a single decree [August 1662] not less than 23 churches were pulled down on the merest pretences; and in four years 187 Protestant places of worship were destroyed. A monk of Béarn boasted that, of 123 churches in the province, (resting on the most unquestionable title,) only 20 then remained. Similar cases might be cited in the other provinces of France; and Protestants were often obliged to travel 40 miles or more to attend public worship, or to get their children baptized. The intermarriage of Protestants with Roman Catholics was forbidden; and the next step was to constitute children, at the age of seven years, capable of choosing their own religion. These, with other intolerable oppressions, induced many to determine on quitting France; and, in 1682, three thousand families emigrated from a single quarter. This rapid depopulation of the country alarmed the Government, and an act was passed declaring departure from France severely penal. Part of the French army, which was then marching against Spain, was turned to the south of France; these were quartered upon the Protestants, and their oppressive and overbearing conduct is since recorded under the name of the "Dragonade." Notwithstanding the numerous petitions presented to the king entreating his clemency, of which the last, couched in the most submissive terms, was placed in his own hands by the Marquis de Bourigny, the General-Deputy, in 1684, he remained inflexible; and on Thursday, the 8th October 1685, the fatal Edict was signed, and the doom of the Protestant church was sealed. To this measure Louis the 14th was incited by the united influence of the Chancellor Le Tellier, his son Louvais, and Madame de Maintenon, as well as by the Jesuits and the Church of Rome. The "Revocation" con sisted of a Preface and twelve Articlesa; and these were so rigorous that the entire Protestant Church was utterly crushed, and those who possibly could, hastened to the frontiers. These, however, were strongly guarded, as Louis did not wish to lose such good subjects; so that the fugitives were beset with danger: however, by gaining over some of the guards, no less than fifty thousand families were enabled to escape. These dispersed and settled in various countries, benefiting them by the introduction of their arts and manufactures. Those who were not fortunate enough to escape endured the most dreadful punishments. Some were hung up by the feet, and fires of wet straw lighted under them: when nearly dead, they were taken down and asked to abjure their religion, and then, if they refused, the torture was again applied. Some were half roasted; others, tied with ropes, were plunged into deep wells, from whence they were not drawn out until they promised to abjure. Laval in his history of the Reformed Church of France, has an appendix of 100 pages in which he describes, in detail, the seven different ways in which Louis tried to force the Reformed to change their religion. Many of the highest rank and station, (such as Marolles, and Le Febvre,) were consigned to the galleys, where they lived in chains for many years, or died under the hands of their task-masters. However, as already mentioned, large numbers effected their escape: and arriving in Switzerland, Germany, England, Holland &c., were kindly welcomed in each.b Great exertions were made in their behalf by the Queen of Denmark; and the Swiss showed the greatest sympathy, and received, without exception, all who came, concealed as the were under the most varied disguises. Women were often dressed as men, and children packed up in chests as clothes. Those who passed into Holland at once received patronage and protection from William, Prince of Orange; and all who had served in the French army received commissions of equal rank in his service. Several entire regiments of the refugees were formed, and accompanied him to England, and eventually to Ireland. Here, after peace was restored, they formed several settlements, being joined by numbers from England and Holland. The chief localities of the colonies in Ireland were Lisburn (then called Lisnagarvey,) Dundalk, Dublin, Portarlington, Youghal, and Cork. Here they enjoyed many religious privileges, having their own pastors, their service conducted in their own language, and their ministers supported by the state. In Portarlington the service was performed in the French language till within the last fifty years. This colony consisted, besides the Crommelins, of about twenty-seven families, who were accompanied by many respectable tradesmen. These settlers closely adhered to each other, generally intermarrying for two or three generations; and long cherished the hope of being one day enabled to return to their own country. During the reigns of William and Anne they continued to enjoy many privileges and marks of favor. King William, after some time, considering that Louis Crommelin had expended, out of his private fortune, a capital of £10,000 on the undertaking, granted to him a pension of £200 a year, during his life. Louis, however, requested that this pension should be given to his son, which was accordingly done; but this son dying only three months after,h the pension reverted to the crown, and was not renewed; so that Louis himself derived no benefit from it. Louis Crommelin had many personal interviews with the King, who shewed him much honor; and he likewise received the formal thanks of the Irish Parliament in 1707. He was followed to Ireland, some time after, by two of his brothers, who brought with them a capital of £20,000; each brother having been left £10,000 by their father. Several tradesmen, also, came with them; and finally Alexander, the third brother, and Madeline, their sister joined them. The other sister, Marie, had married, whilst in Holland, Nicholas de la Cheroy; after his death, in 1706, she, likewise, with her children, Samuel and Madeline, came to reside at Lisburn, near her brothers. Closely connected with the Crommelin family was that of De la Cherois, also Huguenot refugees, and forming part of the colony at Lisburn. They had suffered deeply under the persecutions in France; and at length were so utterly scattered and despoiled that, after the general flight, only two members of the family were known to have remained behind; and those two were deaf and dumb co-heiresses, who had been placed for education in a convent. Immediately on the departure of their rightful guardians, they were forcibly detained, and their property confiscated for the use of the convent. The only branch of the De la Cherois family, which can be traced at all through their Irish descendants, is that of Languedoc, to which belonged the three brothers who fled to Holland. Of their previous history scarcely anything is now known, more than is above stated; owing to the peculiarly reserved character of the first of this family who settled in Ireland. He felt so deeply the utter ruin of his fortunes, and the banishment from his country, that, in his anxiety to spare his children unavailing regret, he always evaded entering into the particulars of his history. The few that have been ascertained have been obtained chiefly from old papers and fragments apparently preserved by chance, and from some of the original old Commissions. From these sources we learn that the family was derived from a small town or "seigneurie," called Chery or Cheroy, near Sens, in the province of Champagne, where, in the beginning of the 17th century, they had large possessions, and where they had continued in the rank of noble "proprietaires" for upwards of 500 years. They were connected with some of the first families in that country; amongst others, with the noble house of Montmorenci, by the marriage of Catherine de la Cheroy with Jean, Seigneur de Beauferney, whose daughter married Antoine de Montmorenci. We also find in an old French genealogical MS. the following account of some alliances of various branches of this family, commencing as far back as the year 1400, when the name seems to have been Chery. In this is related how Louise de Chery married "Raoul de St. Reiny;-- Chevalier tué à la bataille d' Agincourt en 1415." We next find a Seigneur de Chery, de Senailly, et d' Ieche, marrying Ammesson de Veroncourt, who was left a widow in 1449; "avait le bail de ses enfans, et fit hommage pour eux de la terre de Cheroy." Her eldest son, Jean, married, first, Isabel de Huacourt, and secondly, Catherine de Choiseul, who appears to have been an heiress, and in right of whom her children and husband assumed the name of Choiseul. By her he had issue, 1. Claude de Choiseul, Sergent de Chery, and Maitre des Regents, who married "Marie de Beauvais, veuve d'Olivier Le Fevre d'Ornessan, et fille de Claude de Cahout, Seigneur des Ormes, Président des Tresoreries de France a Orleans, et de Marie Fontaine des Montres:" and 2. Jeanne, who married "Charles de Courtenay, Seigneur de Blenan, et de Catherine de l'Hospital:-- il fut l'un de ceux qui prirent les armes pour s'opposer au Due de Orleans en 1485, et se trouve à la battaille de St. Aubia du [ ,] en 1488." Dying of the wounds he received at this battle, his widow Jeanne, married again, (17 April 1502,) Pierre de Poliegue, Seigneur de Borneville. After this we find no memorial until 1616, when it is stated that "Robert, Seigneur de Chery, et de Beauchamp, en Bourgogne, et de la Chapelle, fils de Jean, Seigneur de Chery et de Françoise Le Conquerant," married (16 Sept.) Marie de St. Simon, by whom he had one daughter, Marie Therèse, who married "Pierre Forest, Seigneur de Bellefontaine et de Puisseux, Conseiller au Parlement de Paris." By him she had a daughter, "Marie Anne, qui fut mariée par contrat, 4 Juin 1698, à Bonaventure Frotier, Seigneur de la Messalière, dit le Marquis de Messalière, reçu page de la grande écurie du Roi, le premier Janvier, 1672; après avoir été Exempt des Gardes du corps du Roi, il fut nommé Lieutenant des Grendarmes de Bourgogne le 31 Janvier, 1672, Brigadier de Cavalerie en Jan. 1702, fut blessé à la bataille de Hochsted au mois d'Août, 1714, et conduit en Angleterre. Il fut nommé Maréchal de Camp, au mois d'Octobre, la même année, et mourut en sa terre de la Messalière, 14 Sept. 1711." His wife (Marie Anne) "s'est remariée, Fevrier, 1720, à un Exempt des Gardes du corps du Roi, ayant eu de son premier man quatre enfans." These notes, however, are so incomplete that we must take up the history of the Languedoc branch through the "Capitaine Samuel," a younger son of the Cheroy family. We find him first mentioned, in 1600, as an officer in the army, and obtaining a company about 1641: serving, no doubt, frequently under the banners of the great generals of the time, and in the wars with Austria undertaken by Louis XIII., under the rule of Cardinal Richelieu. Of his three sons, two followed his example, and embraced a military career, while the eldest, Daniel, remained at home with his father; who, on retiring from the army, had married an heiress in Languedoc, and settled there. At his death he left a handsome fortune to his eldest son, besides providing for his two daughters, Judith and Louise, and for his younger sons, Nicholas and Bourjonval, then subalterns in a regiment of Fusiliers. Nicholas' commission as Lieutenant, bears date 1675; and he was promoted to a company in 1677, at which period we find his brother Bourjonval a Lieutenant also. They had the honour of serving under the great Condé, who, with Turenne, at that time shed such a lustre on the French arms. Condé, however, resigned the command of the armies of France about this time, and died shortly after the Revocation of the Edict of Nantes. The two brothers remained with the army, and generally in action, until the "Revocation" compelled them to fly with so many of their countrymen. Nicholas and Bourjonval went at once to Holland, whither Daniel followed them. Judith and Louise, their sisters, who seem at first to have been averse to leaving France, were, in the end, obliged to fly in disguise, on horseback, accompanied by a faithful page, travelling always by night, and concealing themselves in the woods during the day. They took with them all the jewels and money they could carry, hiding them in the folds of their dresses. They made their way to Ham, where they continued to reside for some years; though eventually they followed their brothers to Ireland. The three brothers having, as we have said, fled to Holland, were there received with the utmost kindness by William, Prince of Orange. He at once enrolled all the Huguenots, who had been of the military profession, in distinct regiments attached to his own service, in which the officers obtained commissions of equal rank to those which they had held in France. Nicholas de la Cheroy was given a company, and Bourjonval a lieutenancy, in the regiment commanded by Colonel de Cambon, while Da niel was made a lieutenant in that of the Comte de Marton. They remained, from this period, closely attached to William, and constantly engaged in his service, until the time of his ascending the English throne, when they also were among his followers. During their residence in Holland, they became known to, and finally connected with, the Crommelins. Both Nicholas and Daniel married ladies of this family; Marie, (sister of Louis Crommelin, employed by King William to introduce the Linen Manufacture into Ireland,) becoming the wife of Nicholas; and Madeline her cousin, the wife of Daniel de la Cheroy. [a] The Preface is meant as an apology for the measure, and, as might be expected, is full of false statements. By the 1st Article, the King repeals the protective edicts in all their extent, and ordains that all the temples, which may be yet found standing in his kingdom, shall be immediately demolished. By the 2d. he prohibits all religious assemblies of what kind soever. The 3d prohibits the exercise of religion to all lords, and gentlemen of quality, under corporal penalties, and confiscation of their estates. The 4th banishes from the kingdom all the ministers, and enjoins them to depart thence within fifteen days after the publication of the edict, under penalty of being sent to the galleys. In the 5th and 6th he promises recompenses and advantages to such ministers, and their widows after them, as shall change their religion; and ordains that those children, who shall be born thenceforward, shall be baptized and brought up in the Catholic religion; enjoining parents to send them to the churches under a penalty of 500 livres. The 9th gives four months time to such persons as have already departed out of the kingdom to return; otherwise their goods and estates to be forfeited. The 10th prohibits all his subjects, of the said religion, and their wives or children, from departing out of the realm, and from conveying away their effects: under penalty of the galleys for the men, and confiscation of money and goods for the women. The 11th confirms the declarations heretofore made against those that relapse. And the 11th declares at that, "as to the rest of his subjects of the said religion, they may (till God enlightens them) remain in the cities of his kingdom and the countries and lands of his obedience, there continue their commerce and enjoy their estates without trouble or molestation on account of the said religion, on condition that they have no assemblies under pretext of praying or exercising any religious worship whatsoever." [b] See Appendix. Many went to Ireland, the Cape of Good Hope, Jamaica, North Carolina and New York. A small colony came from Picardy into Scotland, and introduced there the manufactures of silk and cambric. Another party came from Bordeaux, and settled at a village near Edinburgh, still known by the name of "Bordy-house." At Glasgow, also, a paper manufactory was established by a French Huguenot who escaped, accompanied only by his little daughter; and who was obliged, at first, to support himself by picking up rags through the streets. Not less than 20 millions (francs) of property left France with the emigrants. [c] The following is an abstract from this Act. The Linen manufacture was to be set on foot and encouraged in Ireland, so as to make it the staple trade of this country. Spinning to be taught gratis to the children of those who were not worth more than 40 shillings per annum. At every Summer Assizes it might be lawful for any female inhabitants of a district to come and show their skill in spinning on the double wheel: a premium of £10 to be awarded by the Grand Jury to the one who should spin the best thread in an hour, and her name to be recorded in Court as a "mistress-spinner:" a certificate of the same to be granted, without fees, in presence of the Judge, Sheriff, and Foreman of the Grand Jury, entitling her to privileges in whatever city she dwelt. And that poverty might not keep any back, two pence per mile was allowed for travelling expenses: the person, if destitute, to receive double relief from any charitable society in the place. Every weaver at Summer Assizes, might bring a piece of cloth as sample of his workmanship; the best piece to receive £10 premium, adjudged by the Foreman of the Grand Jury, those conversant with the Linen Manufacture, and an officer appointed by the directors of the trade:-- the workman to be recorded as a "master weaver." Five directors to be appointed, each roceiving £100 a-year; their salary to increase as the trade prospered. [d] This was discontinued after his death. [e] This still exists, being the present Court-house of Lisburn. [f] There were three French Chaplains in succession. The first was the Rev. M. de la Valade; the second remained only 2½ years and his name is not known: the third was the Rev. Saumarez Dubourdieu. who was minister for 45 years, and was so beloved in the neighbourhood that, in the insurrection of 17i8, he was the only person in Lisburn whom the insurgents agreed to spare. -- The clerk of the chapel was M Peter Goyer. [g] Now in the possession of the Rev. E. J. Cordner, Derramore, Lisburn, a relative of the writers. It is printed in folio, at Geneva, A.D. MDCLXXVIII; the Title-page is as follows: "LA SAINTE BIBLE, QVI CONTIENT L'ANCIEN ET LE NOVVEAU TESTAMENT, C'EST A DIRE, L'ANCIENNE ET LA NOVVELLE ALLIANCE. LE TOUT REVEV ET CONFERE SUR LES TEXTES HEBREVX ET GRECS par les Pasteurs et Professeurs de l'Eglise de Geneve. Avec les Indices et les Figures necessaires pour l'instruction du Lecteur. On a ajouté en cette dernière Edition les Pseaumes de David, mis en rime Francçoise per Clement Marot, et Theodore de Beze. A Geneve, chez lean Anthoine Chovët. MDCLXXVIII." An Epistle is prefixed, addressed, "A tous ceux qui aiment la vérité de Dieu, comprise dans les Livres de l'ancienne et de la nouvelle Alliance: Grace soit et paix, de la part de Dieu nôtre Pere, et de nôtre Seigneur JESUS CHRIST:" -- and concludes in these words. "Au reste tres-chers freres, en quels lieux, paĭs, royaumes, et nations, que vous-vous trouviez unis, ou mêmes en quels endroits que par la malice des temps vous soyez épars, puis que c'est principalement à vous que nous avons desiré et tâché de servir, en proposant en nôtre langue maternelle ce grand et indicible thresor, selon nôtre capacité: c'est aussi à vous de le recevoir avec une droite affection, pour y chercher cette perle uniquement precieuse de la connoissance, erainte, et amour de Dieu, et de nôtre Seigneur Jesus Christ, qui est ici misc comme en son Sanctuaire, au lieu qu' ailleurs il n'y a que des cisternes crevassécs, et des ruisseaux troubles des inventions humaines; par lesquelles les hommes sout reudus, non pas religieux, mais superstitieux; dont il ne naist qu' un penser, et non un croire: une opinion, et non une vraye foy." Then follows the form of Church Prayers with the manner of celebrating marriage, administering the sacraments &c. The whole concludes with the Catechism, and the Confession of Faith, which last is thus entitled:-- "Confession de Foy faite d'un commun Accord par les François qui desirent vivre selon la purete de l'Evangile de nôtre Seigneur, Jesus Christ." [h] His grave is in the present church-yard of Lisburn: the tomb-stone in the wall bears the following inscription: "Six foot opposite lyes the body of Louis Crommelin, born at St. Quintin in France, only son to Louis Crommelin and Anne Crommelin, Director of the Linen Manufactory, who died beloved of all, aged 28 years, 1 July, 1711. LUGE VIATOR, ET UT ILLE. DUM VITA MANEBAT, SUSPICE COELUM, DESPICE MUNDUM, RESPICE FINEM." [i] Louis Crommelin, having lost his only son, left one daughter, who married Capt. de Berniere, likewise a Huguenot. Alexander, the third brother, had been married in Holland to a Mdlle. de Lavalade, and had two children:-- 1, Charles, who died unmarried; and 2. Madeline, who married Archdeacon Hutchinson, by whom she had three children; 1, Samuel; 2, Frances, who married D. Browne, Esq. ; and 3, Matilda, who married R. Smyth Esq., of Duncree, county Westmeath. William, the younger brother, settled in Kilkenny, being one of the assistants appointed to his brother Louis: he conducted the branch of the Linen trade established at that place. He married Miss Butler, one of the Ormond family, and had two children; Louis, who died unmarried, and Marianne. Samuel, the second brother, married, after arriving in this country, the daughter of General Bellecastle; by whom he had issue four sons, Samuel, Daniel, James, and John; 1, Samuel, married Harriet Mangen, by whom he had eight children: of these only one left children, viz., Mary who married Mr. De la Cherois, of Donaghadee; and Jane, who married R. Hammond, Esq. ; 2, Daniel, married Madeline, daughter of Major de la Cherois, by whom he had three sons, Daniel, Nicholas, and De la Cherois. Of these, only De la Cherois left issue, a daughter, Mary Angelica, who married Dr. Hutchinson, and was mother to Mrs. G. Leslie, of Donaghadee. 3, James, married a French lady, Mdlle. Gillotte, but died without issue. 4. John, likewise married a French lady, Mdlle. de Blacquiere, by whom he had one son, Isaac, who afterwards went to Holland, married and settled there, with the family of Madeline de la Cherois, (mother of Lady Mount Alexander,) who had never left Holland, and whose descendants still continue there. Madeline Crommelin, sister of Louis, and daughter of the first Samuel, married Paul Mangen, Esq. Marie Crommelin, the only remaining sister, married as we have said, Nicholas de la Cherois, in Holland. The Crommelins in the male line, are thus extinct in Ireland.